In the middle decades of the 20th century, carving limited-access highways through the middle of neighborhoods and city districts was considered the unavoidable price of progress toward the all-important goal of increasing traffic flow. These highways continue to blight and divide neighborhoods, many of which were and still are low-income communities of color, limiting access to open spaces and negatively affecting public health. State departments of transportation should prioritize improving highway segments that cause the most harm to neighborhood health, prosperity, and cohesion, and work with communities and municipalities to remove or transform them into community assets. Whether the roadways were sunk in trenches, elevated above, or built at grade, they broke up neighborhoods, resulted in dangerous and noisy streets, and led to high rates of asthma and traffic accidents. The most problematic examples include the Cross Bronx Expressway, Brooklyn-Queens Expressway, and Sheridan Expressway in New York; Interstates 280 and 78 in New Jersey; and Route 34 and I-95 in Connecticut. In other cases, highways were built at the water’s edge or in parks, mainly because that land was already publicly owned and planners at the time wanted to create parkways. Roads that cut off access to rivers and park space include the Belt, Henry Hudson Parkway, and Hutchinson River Parkway, FDR Drive, and Sheridan Expressway in New York; Routes 21 and 29 in New Jersey; and Routes 8 and 34 in Connecticut. In all but a few cases, removing these highways entirely is not possible due to high costs and disruption. Moreover, residents and businesses have made long-term decisions based on the access these roads provide, and eliminating them without a comparable alternative would create additional problems for neighborhoods. There are, however, many segments of highways that can and should be removed because they are underused or there is an alternative nearby. In other cases, highways can be replaced by a different type of road, such as a boulevard with trees, less traffic, and pedestrian and bicycle amenities. Depressed roadways can be decked over and rebuilt with new housing or open space that reconnect the community to the street grid. Finally, certain highways can be rerouted underground—or “buried”—to eliminate their street-level impact and make land available for housing or open space. The following highway improvements have been recommended based on costs, benefits, and the impacts of both action and inaction. State departments of transportation should launch a new program in collaboration with cities and local communities to implement solutions for these highways. Sixty years ago, Van Cortlandt Park, one of the crown jewels of the New York City park system, was chopped into six pieces with the construction of three highways. An 0.4-mile segment of the underused Mosholu Parkway between the Major Deegan Expressway and Gun Hill Road should be considered for removal or burial, which would create safe east-west pathways in the park and restore its value as a place for recreation. The stretch of the Brooklyn-Queens Expressway (BQE) running through downtown Brooklyn is being considered for redesign or reconstruction by state officials, although burying this obtrusive highway instead would dramatically improve the community’s access to the waterfront. Decking over stretches of the BQE in Carroll Gardens would provide opportunities for new housing. In Williamsburg and Greenpoint, and the public realm below and around the BQE could be dramatically improved, as community members and elected officials have requested. Several segments of the region’s highways can easily be decked over for new development or open space without affecting traffic patterns. In addition to mending scars left by the highway, decking over also mitigates the visual, noise, and air-quality impacts of the highways on nearby residents. Decking over would create more valuable land on the deck itself and in adjacent areas that be could be used to defray the cost through residential or commercial developments. Thirteen segments of six highways in New York City have been recommended for decking over: the Cross Bronx, Bruckner, Gowanus, Brooklyn-Queens, Trans-Manhattan, and Van Wyck expressways. Decking over those stretches could amount to 100 acres of new land. Parcels on the FDR Drive should also be further evaluated for cantilevered development over the highway. In New Jersey, Interstate 280 could be decked over in Newark and East Orange, which would restore the street grid and knit back together neighborhoods. In Bridgeport, Connecticut, a short depressed stretch of Route 8 between Pequonnock and Highland avenues could also be decked over. In 1989, the West Side Elevated Highway in Manhattan was dismantled and turned into a boulevard, West Street, which has since helped nearby communities reconnect with the Hudson River waterfront and led to the building of the Hudson River park, one of the city’s most treasured parks. The last segment of the elevated highway, from 60th to 72nd Streets, should also be taken down. 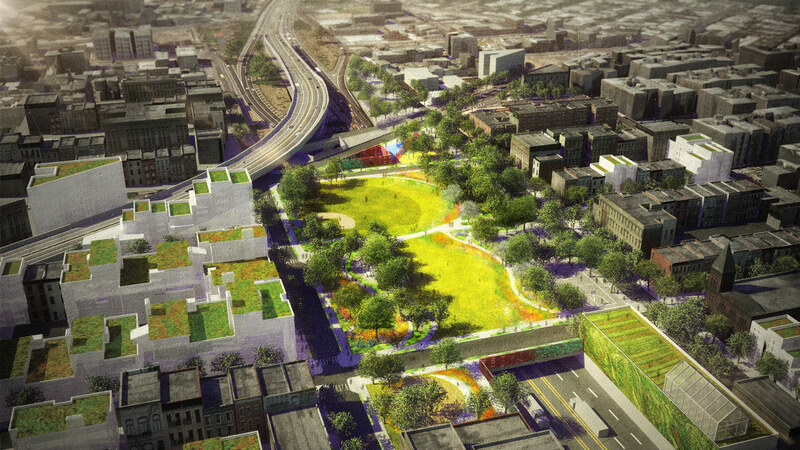 In the Bronx, after years of advocacy from organizations like the South Bronx Watershed Alliance, a 1.25-mile stretch of the Sheridan Expressway is being turned into a boulevard. Current plans, which include new crosswalks, other pedestrian improvements, and lining the street with trees, could be improved by further narrowing the road from three lanes down to two in each direction. The freed-up land could be used for open space and community amenities, which are of far greater benefit to the nearby communities. Route 34 in New Haven is being turned into a boulevard, reducing the roadway’s width and adding pedestrian amenities and new development. The Prospect Expressway in Brooklyn: From Third to Church avenues, a distance of almost two miles, it should be narrowed to one lane in each direction, opening up land for a new bicycle “highway,” residential development, and public spaces. Route 29 in Trenton: A project that has been discussed for decades, it would convert a mile-long stretch of limited-access highway between Trenton’s downtown and riverfront. Tying the road back into the city grid and adding pedestrian features would have tremendous social and environmental benefits. These actions would stitch together neighborhoods, restore communities, and improve local mobility. They would create over 100 acres of reclaimed land for development of housing, mixed uses, or open spaces. Removing, burying, and decking over the region’s highways will improve the health of communities by mitigating some of the noxious air and noise impacts. It would also reconnect parks and other open spaces for recreational purposes such as walking and biking options. The cost of these interventions would be significant, and funding would need to be prioritized within state and city transportation budgets. For example, the New Haven Route 34/Downtown Crossing will cost an estimated $74 million, while some of the more extensive projects will cost far more. Many of the benefits, however, can be monetized in a short time period, including selling off parcels of land for redevelopment, which would add valuable real estate to the tax rolls. Other benefits have longer pay-back periods, such as better public health outcomes and cities with more development and a higher tax base.